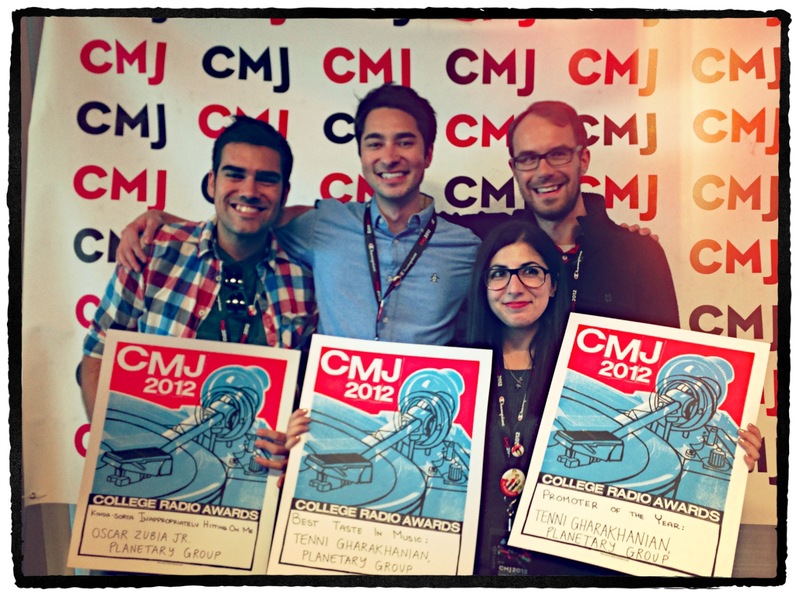 At this year’s CMJ College Music Awards in New York City, every member of our team was part of Planetary’s staggering 10 nominations, landing us in each and every category. In the end, Planetary walked away with nearly half of the industry awards, including Tenni Gharakhanian as Promoter of the Year and Best Taste In Music, and the ever-popular Kinda Sorta Inappropriately Hitting On Me going to Oscar Zubia JR.
We’re incredibly honored and grateful to everyone who voted. We couldn’t be more thrilled to be a part of this Planetary team. Thank you to all! Click for a list of all the award winners and fellow nominees. Here’s to another great year in college radio!